Mesh belt brazing furnace is a kind of equipment for metal brazing and bright heat treatment, suitable for mass production of small and medium-sized stainless steel parts, such as cutting tool, tableware and hardware, etc., and martensitic stainless steel bright tempering, quenching, austenitic stainless steel bright annealing, etc. 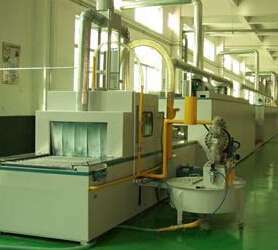 Brazing furnace is mainly composed of degreasing furnace, drying transmission, spraying system, brazing passive, front room, water cooling, strong air cooling and brazing furnace transmission. Brazing furnace is mainly used in metallurgy and steel industry, is applied to the automotive industry filter refrigeration fittings and aerospace industries, in addition, brazing furnace in air conditioning, microwave magnetron, refrigerators and are also used in electronics industry and still have stainless steel, brass, carbon steel and copper parts brazing and bright heat treatment, etc., the application range of the brazing furnace is the general. Brazing furnace has very fine reasonable partition of heating furnace, advanced USES a high precision temperature control meter, the brazing furnace temperature control accuracy is high, the plus or minus 1 degrees Celsius, brazing zone temperature uniformity should be within plus or minus 2 degrees Celsius, which can ensure the soldering sensitive, critical temperature requirements, within the scope of vacuum brazing, to ensure the processed workpiece of bright and clean.